Luxury models from the collection of Chanel Mademoiselle Prive.French fashion house Chanel always amazes everyone with his incomparable products. French fashion house Chanel always amazes everyone with his incomparable products. Exclusive design jewelry and watches of the legendary houses can not be compared with the models of other brands. They have a unique style. Each model is unique in its own way. Amazing models from the collection Mademoiselle Prive – is no exception. This collection company will present at the International Exhibition of antique Biennale des Antiquaires, which will be held in Paris in September. Elegant luxury watches and jewelry in this collection will be exhibited in the pavilion, designed by architect Peter Marino, who is engaged in the development of design showrooms of famous fashion houses. Gorgeous new items from the collection of Mademoiselle Prive were created by masters of Chanel using the original stones, application technique Grand Feu enamel and engraving. On the products of the brand meets the lion, which is no accident. This image was designed in honor of the master of the zodiac sign under which Chanel was born. The lion can be seen in the model Constellation du Lion, presented in white gold and decorated with 513 diamonds snow-set diamond-shaped and 7 “baguette”. Diameter of the circular shell is 37.5 mm, height – 8.6 mm. Original blue dial, inscribed with the constellation Leo. The crown is also decorated with 35 diamonds and blue sapphire. Two arrows, located in the center of the dial, provide an indication of hours and minutes. The model is built on the basis of an automatic caliber with 42 – hour power reserve. Another novelty of this collection is presented in the same shades. 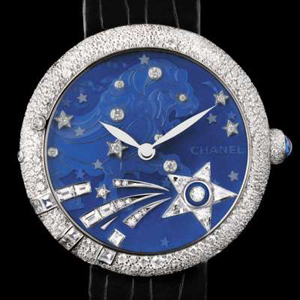 Its blue dial, made of enamel, like the night starry sky. Chanel brand logo adorns the dial in the 12 o’clock position, and an indication of the hours and minutes are two central arrows. Round body 547 new items decorated with stones, dial – 47 diamonds, crown – 38 snow-set diamonds and sapphires. The latest addition of Mademoiselle Privc collection is presented in a completely different style. Dial the third model is the image of the pen of white gold, formed of 63 diamonds, 26 pink sapphires. 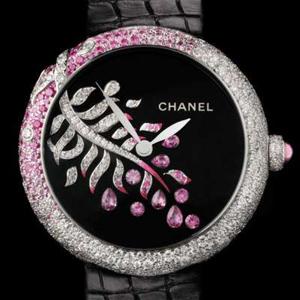 The model is also a round body and encrusted with 316 diamonds snow-set, and the crown – 37 diamonds and pink sapphires.